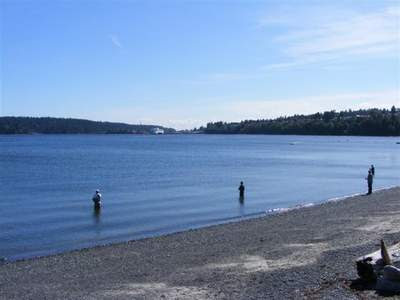 The run of pink salmon in Nanaimo's Departure Bay offers anglers a chance to test their skills. When this picture was taken, about 1:00pm, you could see the occasional fish break the surface, so the fish are surely there. Of course getting them to take your lure is another story, and why the sport is called 'fishing' and not 'catching'. Whatever lure you choose, from flies to stingers to whatever else you fancy probably has a good chance of catching supper. Remember you do need a licence to fish and while the fish are in the Bay they are in salt water, but once in the river, you need to use barbless hooks. 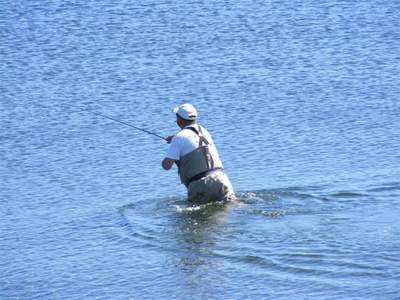 Check with your favourite tackle shop for details if you are uncertain. The weather promises to be great this weekend, and the fish are there, so grab your rod and try your luck at Departure Bay.